← A Bow To Our Readers: Share Your Writing! My living room deck is a lizard freeway. It serves as a form of kitty TV for my Siamese warrior cat. One afternoon this summer I caught movement out of the corner of my eye. Since I’ve named the lizards that entertain me every afternoon, I walked to the open slider to say hello. Taking a momentary break in the sun wasn’t a lizard, but a field mouse. I wished Shogun wasn’t napping in the garage. No! My attic has finally been completely rodent free for nine months and there was no way this little furry villain was getting into my house. The mouse sprinted toward the air conditioning vent. I thought about finding my Siamese hunter and turning him loose, but since he’s an indoor cat. I knew I wouldn’t let him engage the mouse in battle. I slid the screen open, ready to follow the progress of the mouse as it scurried along the long, straight foundation. Ready to yell at it. But a shadow fell across my garden and I stayed inside. A crow that lives in my neighbor’s eucalyptus trees landed on my deck cover. It had only one focus–the tiny, defenseless mouse. No! “Run little mouse,” I whispered. There was no cover for the poor creature and it would have to be very fast to make the corner of the house and the safety of the planter there. The crow launched. I didn’t see what happened. It seemed like an eternity before the black wings appeared, heading for the peak of my neighbor’s roof. The tiny wriggling mouse dangled from its beak. I turned away, sorry for my original anger upon seeing the cute little thing scrubbing its whiskers in the sunlight. Sorry that I did nothing. And I thought about how quickly my perception and feeling about the mouse changed because of the circumstances in that ten second window. As writers, don’t we want to take our readers through that roller coaster of emotion with a whiplash twist of feeling? Don’t we want our readers to be that engaged with our characters and what life throws at them? So how do you strap your reader into the thrill ride of emotion? I’ve listened to lectures on deep POV and read articles about it. But I’m going to share what works for me. Look at everything through your characters eyes. You may say, “I already do that.” But keep in mind, when you’re looking through your characters eyes, you’re also hearing with your characters ears, feeling with their fingers, muscles, and whatever other body part is engaged in the scene. Your nose smells and your tongue tastes whatever passes your character’s lips. Before I write, and when I’m away from home and can’t write, I live the life of my character in the scene I’m going to work on next. I may be driving the freeway, but I was really piloting my one-seater fighter in a desperate battle for my life. (Hmmm, not so different from the freeways of SoCal sometimes.) When I eat my lunch salad I feel what it is like for a character who has survived all their life on only protein bars and powdered protein drinks. A mouthful of crunchy crisp lettuce, the explosion of red bell pepper, and the coolness of cucumber. Working out with my trainer I (on a good day) feel the fluidity and strength of my characters. Working with my one-legged balance and a kettle bell, I am Athena. My trainer says, “Perfect. Do them all like that.” Would that I could. An interesting side effect of living this way is that every thing in my daily life is more vibrant, more exciting. Am I actually in my own POV noticing more and participating more in my life? I think so. When I climb into my character’s body, deep POV is natural. There is so much more going on because instead of writing about the emotions in her head, I feel them in her body. I feel those visceral hits that Margie Lawson talked about at conference. If my character’s solar plexus tightens, I know. And you can, too, by putting yourself not in your character’s head, but in their body. You know, the body doesn’t lie. Back to the field mouse. My body was relaxed when I crossed to the slider, expecting to see a lizard. My chest expanded with an inhaled breath of surprise when I saw the mouse. I remembered the joy of nine months with no little footsteps over my computer room, and anger scrambled up my throat. My mind slammed a steel door on the possibility of this mouse lazing in my attic. I wanted to kill it, but I knew I couldn’t get the right tools fast enough, so I envisioned my cat ripping it apart. When the object to carry out my wrath swooped in, I froze. I didn’t step outside. I felt the stare of the crow as if I were the mouse. You get the idea. Rest in peace, little mouse. And thank you for my writing lesson. How has life supplied you with an unexpected writing lesson in ten seconds? Or more? This entry was posted in Craft, Inspiration and tagged Deep POV, Fae Rowen, Margie Lawson, visceral responses, Writers in the Storm, writing, writing emotions. Bookmark the permalink. Fae, the best things I learn from a few seconds is dialog. I love eavesdropping in public places…love how people don’t finish sentences, use subtext, don’t say what they mean. People are SO fascinating! Thanks for the lesson, and the reminder to live, full-throttle! Overheard dialogue is the best! In San Francisco, my husband and I were eating at a local eatery, In the cramped space the tables were squeezed together and almost touched. A man and woman next to us were talking, but each was going on about a topic wildly different from the other, with no reference to what the other one said as they ping-ponged words. “Let’s sell the house.” “These shoes are too tight.” “We might get good money for it.” “And the bag doesn’t match.” We laughed all the way back to our hotel. I’m used to my characters “stepping into my body” (they present themselves as voices in my head, and no, I’m not on any meds, lol) and just telling me how they feel, but the way you describe the process of deep POV makes sense and I see how that will give more depth to my writing. Thanks! Oh, my characters invade my body all the time–we can be crazy together! But stepping into their bodies–that’s what turned the trick for me. Thanks for reading. When I feel an unexpected emotion, I take note of what caused it, what was said or done, what *changed* so that the emotion I felt wasn’t what I’d been planning to feel. Surprise is the prime element of humor, but it’s built into every roller coaster on earth, too. Oh, thanks for that nugget, Joel. I’d never thought about surprise being the prime element of humor. At least you don’t have to worry about getting a ticket on the freeway while you’re flying your skimmer! What a delightful, thoughtful–and helpful–post. It’s an excellent example and a reminder to live our characters and inhabit the world we build. Thanks, Barbara. When I get these insights I wonder if everyone knew them but me. I used to be an actress, so when I write an emotional scene, I try to act it out. As you say, I delve into what my character experiences. Loved your story of the mouse vs crow. I never knew crows ate live critters, so I learned that and something about deep POV. Thanks Fae! Thanks for your kind comments. Tiffany Lawson Inman did a post for us about acting out our scenes. I’m going to have to dig into the archives and re-read it. It was fun to act out a scene at Margie Lawson’s Immersion class, too. Great reminder! Loved your example of avoiding, or not, rollercoastering readers’ emotions. Would like to be able to use it in a short writing class I’m doing this fall. If I have your permission, please contact me at barbarabarrett747@gmail.com. Whether you do or not, thanks for the lesson. Don’t we love our babies? 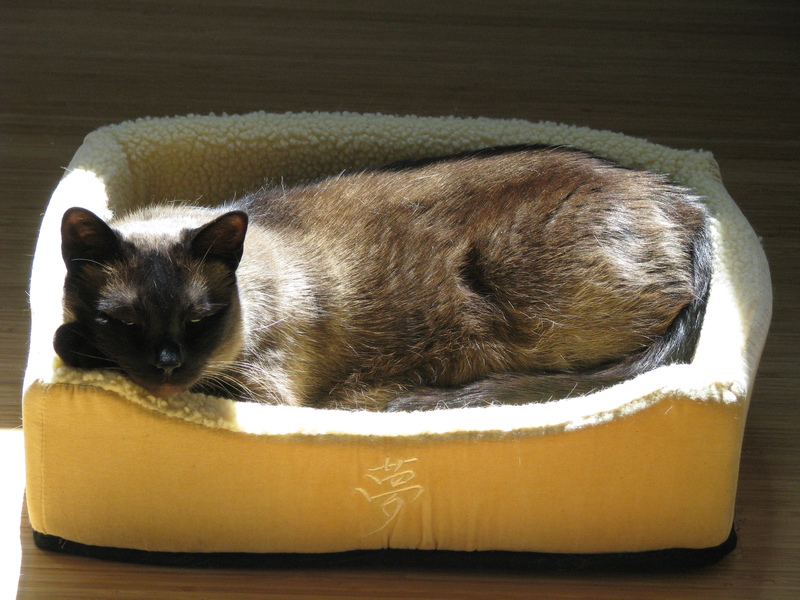 I’ve lived with a Siamese since I was six. I can’t imagine a day without purrs. Thanks for the smile. That is the best explanation of how to get into deep POV that I have come across. It will definitely give me a new way to look at my WIP. Oh, and isn’t funny how our point of view can change so quickly? Like when you’re watching an animal documentary- one minute you’re all about the beautiful lion and then it goes in for the kill on a defenceless baby gazelle and your emotions suddenly swing. You remind me of a day on safari where we followed three cheetahs for an hour. They found a herd of wildebeasts and became predators. I cried with the bleating mother who lost her baby to them. Deep POV. Stellar post, Fae. I’ve heard it, I’ve read about it, I’ve tried to practice it. But, your experience nailed the concept for me. Thank you. Thanks also to the snoopy person within me who could not delete a WITS post even though she was a day late to the party. Oh, Gloria, you know the party’s not over after just a day. After all, my motto is, “Anything for a party!” Wahoo, you arrived! Nice post! It is amazing how quickly our own emotions can swing as our perspective shifts. I like the way you’ve explained deep POV and provided examples. I do think this is something I do pretty well, but I can always improve! Now I’ll eagerly await posts on pacing/plotting…my personal weak spots! You guys do such a great job with this blog. Thanks for sharing all of your wisdom, expertise and experience! Thank you for your kind comments, Jamie. And thanks for letting us know what you’re waiting for. While you wait for new posts on pacing and plotting, we do have some help for you in those areas in our archives in you want to take a look. Kara Lennox wrote a wonderful series for us on your topics. Excellent post, Fae. Writing in deep POV is quite an exercise as I found out when I went deep for the bad guy in a recent manuscript. It was a little disturbing, but fun. But I’ll bet you made your villain much more dimensional with your deep POV! And you’re still standing. A great post from WITS on emotion. Great post!! Tweeted, shared and reblogged. Thanks, Ella. I’m so happy that lucky coincidence (there really aren’t any) sat me at your table for the Keynote Luncheon in Atlanta. Great to meet you in person. Thanks for the blog love. I loved meeting you as well, Fae!! Next time, we’ll have to plan a time to chat. If I had a dollar for every grammar slip, I’d have a very different lifestyle! No problem, Layla. Thanks for your kind comment, Layla. And for sharing the post. That is a very good way to encourage deep POV. At one time, Deep POV was thought as something negative, excessive and great writing tantalized the brain, not the senses and now it’s all the rage. I think we’ve moved to deep POV because it’s something writers can do that movies cannot. It’s something no other type of entertainment can provide as well. Ah, your insight about why deep POV has become the talk of classes and conferences opened my eyes. Of course we can’t see this in movies unless we get a monologue from the character, which would be action-stopping in a movie. And it’s probably why people usually like the book better than the movie. Thanks for this. Great post on deep POV. I have so BT/DT with flip-flopping emotional responses, lol. It’s one reason I no longer watch tv documentaries about predators. I know they have to eat, but wish their meals didn’t have to be the cute, fuzzy things. Great point taken about perceptions, though. I’m with you on the predator/prey thing. While on safari it was incredible to follow three cheetahs on a two-hour hunt, the ending was difficult.